Yorkshire terriers, also known as Yorkies, are not the kind of pets you can just place a bowel a food in front of them and leave them alone. These dogs require a lot of care and training. While they do not take up much space, these puppy pet owners need some basic facts about the dog to ensure many years of healthy living. Yorkie puppies have long, beautiful coats that require a lot of maintenance. Brush their coats thoroughly every day so that they do not become matted. Beginning this activity at an early age ensures that the pooch will learn to tolerate its daily grooming. A Yorkie puppy may not eat much, but needs a diet low in fat and high in nutrients. Mix soft food with dog food in order to keep the teeth healthy. Watch out for food allergies and adjust the puppy's diet as necessary. Monitor him to see that your puppy is drinking plenty of water, espcially if the active puppy plays often. These puppies have lots of energy, making them susceptible to low blood sugar. If you think your puppy may be running low, place a small amount of sweet water or syrup for him, to make sure you keep the sugar levels at normal. After 12 weeks of age, the puppy usually grows out of this risk. Yorkie puppies can pack quite an attitude. No stranger or knock at the door will go unnoticed by these little watchdogs. Work with your puppy early to ensure that the warning bark does not become too shrill. 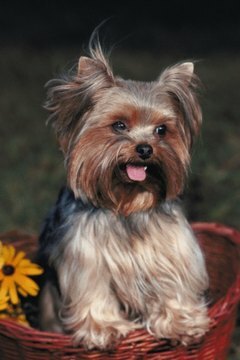 Yorkie breeds are prone to developing various medical problems, so take your puppy to the veterinarian regularly . Keep all appointments and make an additional visits if you notice any drastic changes in your puppy's behavior. Because these types of puppies can be stubborn, many pet owners of Yorkies have trouble developing a housebreaking routine. Many have found success at five and six months old. In the meantime, you may want to consider having an indoor litter box or doggy door leading to a small covered potty yard. Yorkie puppies despise the cold and wet weather. Many times these dogs will not want to place their pampered paws on wet pavement or on the porch after a snowfall. This can also make housebreaking all the more challenging. Yorkie puppies are quick to take ownership of things like food and toys. Properly instruct them that you won't tolerate his behavior. Speak your disapproval in a stern voice. Because Yorkies want to please their owners, this form of punishment will likely deter the possessive behavior. These affectionate puppies make great companions because they are loveable lap dogs. Yorkies want to bask in total comfort, so they would be more than happy to snuggle in between soft pillows or on your chest while you watch television. Because they require much attention in their day-to-day care, Yorkie puppies also need a lot of patience. Be firm but fair with your new pet. The first year is the most difficult, but your puppy will develop a better temperament as it grows older.